I found my grandmother’s Women’s Voluntary Service badge in an old oriental box she left me. When I told my mother about it, she said, ‘Meals on Wheels’ and showed me her own badge – by then it was the WRVS. I joined my local branch, now plain RVS, and delivered meals for over 10 years until it was taken over by the local authority and so now I have a collection of 3 badges. During my time volunteering, I met a huge range of mostly elderly and always incredibly grateful recipients and the thing I noticed was that while the food was disgusting, they were always delighted to see me. They were all stoic, delightful, humorous but lonely. It was this that gave me the inspiration to write about oldies. I wanted to give a perspective on old age that was upbeat and funny. I often delivered to residential homes and here too and somewhat surprisingly I came across isolation – particularly amongst the men who felt alienated amongst the overabundance of females all chattering wildly and bossing each other about over raffle tickets. It was this that got my imagination going as I pondered the idea of a romance. The dating agency Ancient Eros that features in the book is a concept I should like to think is a viable concern. The setting of my novel in an up-market home is idealistic but through its escapism, I hope it brings a smile to the faces of old and young alike as they read of the antics of the characters who inhabit the world of Wellworth Lawns. There has been so much in the press of recent years about poor conditions in care homes and of loneliness and so I gave my heroine, Lady Laura Boxford, a dog as her companion – she has plenty of love interest too, don’t worry. Parker, her pug, was inspired by my own mother’s recalcitrant Jack Russell, Midge. Midge has been the faithful companion to my mother for 15 years. 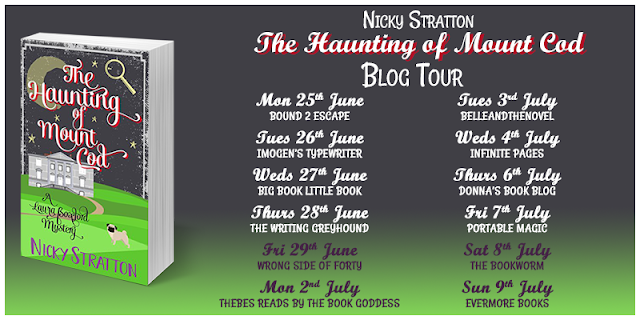 She didn’t ever meet my father – probably a good thing as he was particularly averse to badly trained dogs – but Midge was witness to the second marriage of my mother who at the age of 74 remarried my stepfather, then himself aged 76. Midge was also was there when he died after 10 happy years with my mother. So now her position is paramount as my mother’s trusty companion and she continues to bring joy even though she is now stone deaf and extremely badly behaved. Laura’s best friend in the Book is Venetia. Her character, while obsessed with TV shows, some of which are highly inappropriate, hints at her having some form of dementia, but it does not hinder her in her creative endeavours. My mother too takes comfort in the regularity of daytime TV and I can only admire the producers of such shows as Pointless and Homes under the Hammer for getting their format so absolutely spot on. Now that my mother cannot really read – she looks at my father’s published memoir but really only sees the pictures and she thinks my first book is called The Sound of Music (would that it was) these TV shows are a lifeline and the fact that she has instantly forgotten what happened means their repetitive formula never tires. My mother’s life has been one of great adventure. She was an accomplished horsewoman and jockey, a surprising achievement being the winning of the Kuala Lumpur Town Plate in 1958. She also held the record for catching the largest Marcia fish and for many years the famous London fishing shop, Farlow’s, had a photograph of her with the catch behind their cash desk. During her life, she also collected a huge range of friends. Many of them are now dead but they were characters so rich in humour and compassion that I have to say that I have stolen some of them and while sadly my mother no longer remembers much after her idyllic childhood in India, they remain as a testament to a long and varied life. I hope I have done them justice in some of my portrayals in The Haunting of Mount Cod. I’m sure all of them would have enjoyed the idea of a murder mystery in the spirit of a good game of Cluedo. Nicky Stratton came second in a short story competition when she was twenty; the prize was a brown typewriter called The Underdog 2000, but rather than become a novelist, she embarked on a thirty-year career as a copywriter. Alongside work, Stratton raised two children plus a veritable menagerie of animals, including a hawk; she also took an Open University degree in Humanities, graduating at the age of fifty with a 2.1. She finally published her first novel, The Weight of Death, in 2016. Nicky Stratton lives in Stratford upon Avon with her partner Myles. 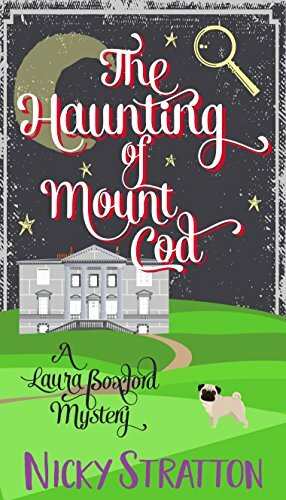 The Haunting of Mount Cod is available to buy now. Will you be grabbing a copy of the book? Let me know in the comments below!